General Manager Group Strategic Planning and New Activities at Hellenic Petroleum and Executive member of its Board of Directors. He is responsible for strategic planning, new business development, management of strategic projects and participations, the renewables business, and the Group's representation in international organizations. 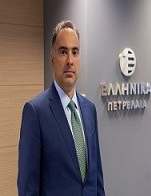 He has represented Hellenic Petroleum on the Board of the European Petroleum Refiners Association as a Principal or Alternate Director since 2012. He joined Hellenic Petroleum in 2007. George Alexopoulos was Director of Business Planning & Development at an international, diversified business group (SETE S.A.), based in Geneva, Switzerland, from 1998 to 2006, while at the same time being responsible for the Group's energy portfolio. He had previously worked in various technical and business development positions at Stone & Webster, Molten Metal Technology, Merck, Dow Corning, and Dow Chemical in the United States between 1993 and 1997. He holds an MBA from Harvard Business School (1998) and M. Sc. (1993) and B. Sc. (1992) degrees in Chemical Engineering from the Massachusetts Institute of Technology (MIT). He is married to Elizabeth Spada and they have 3 children.